After the cyclone, we needed to reschedule our Anger Management workshop for women, but we are back on track now, and the workshop is set to start on Thursday, March 19th at 9.30am. Please see the attached flyer for further information, and distribute/display as you wish; registration is necessary to assist with resources and catering. 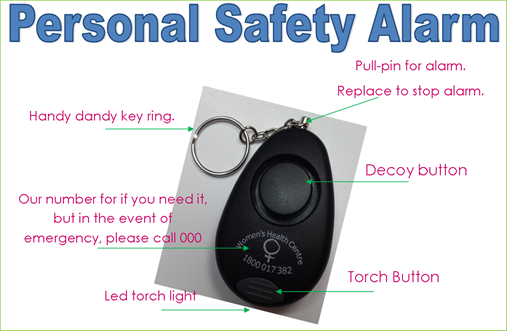 Just an email to let you know that The Women’s Health Centre is working to make our community a safer place with its latest initiative of the promotion of personal safety alarms. The effectiveness of things like loud noises to impede a personal attack – particularly attacks of opportunity against women – are often prevented when the victim surprises the attacker with the capacity to emit a very shrill, loud noise that will attract people from a distance. Activated by pulling the pin, the alarm will omit an ear piercing sound to shock and deter an attacker, and draw attention. It is compact, can be placed on a key ring, and has a built in LED torch. The alarm can be reset by replacing the pin, and the battery can be changed in the event of flattening. We are currently selling the alarms for $10 each. For every alarm purchased, we will donate one to an individual who otherwise may not be able to afford one. Just a quick update to let everyone know that the Women’s Health Centre held the first Self Defence Class Wednesday night. We had 12 participants, aided by 3 instructors and the feedback has all been very positive. So much so, that we are having our second class in a fortnight – Wednesday 17.09.2014, with all participants willing to return and NEW ones very welcome. We have decided that each time we hold a class we will recap on what we have previously learned to ensure that we not only remember what we have learned, but that we become more proficient in the moves we have been shown. This will also work great for those who want to join the classes at any time, as they will then also learn what has been shown in previous classes (not miss out on anything & allow new comers to join in). Practised skills to assist them to stay within their role as administration workers. We have identified that there is not a lot of training specifically aimed at Administration staff in the Community Services Industry and believe this is a wonderful opportunity to be able to bring this to Rockhampton. The Women’s Health Centre is very excited to be involved in organising Women’s Self Defence Classes. The self defence classes will be great for developing confidence whilst learning a range of personal safety strategies. The classes will be suitable for women and girls. Classes will be on a Wednesday night and will commence as soon as we have 20 participants. The classes will be run by a Male instructor with over 20 years’ experience in martial arts and is a well-known instructor currently providing Tae Kwon Do classes in the Rockhampton area. 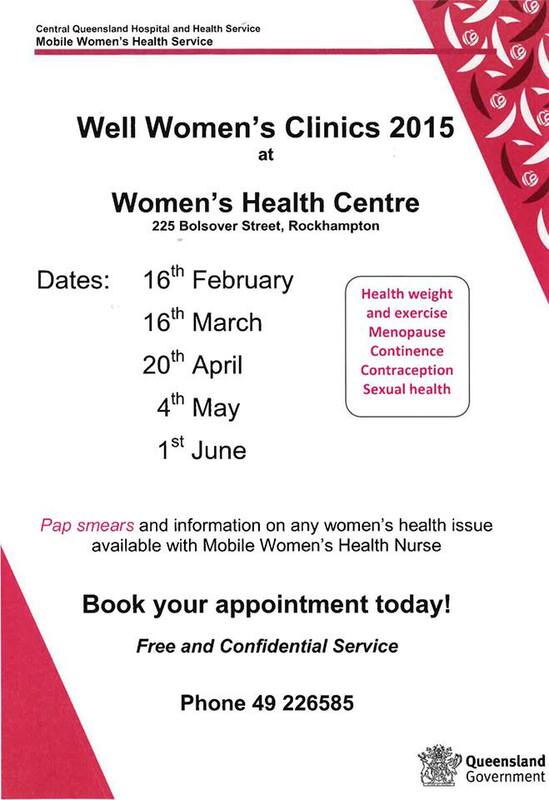 For further information or bookings (bookings are ESSENTIAL) please contact Louise at the Women’s Health Centre. It may seem just too hard to stop smoking – the cravings and nicotine withdrawals, fear of gaining weight, automatically reaching for a cigarette when you’re on the phone or driving, feeling depressed, stressed or stressed (or all of them). Did you know research has shown that each past attempt to quit is a step closer to freedom from cigarettes. The Women’s Health Centre CAN HELP YOU in a safe and confidential environment to take a step closer to freedom. Take time for you by acknowledging your emotions and belief’s and how that contributes to your fears and addictions. Share your story with others regardless of what stage you are at right now. What stage are you at? 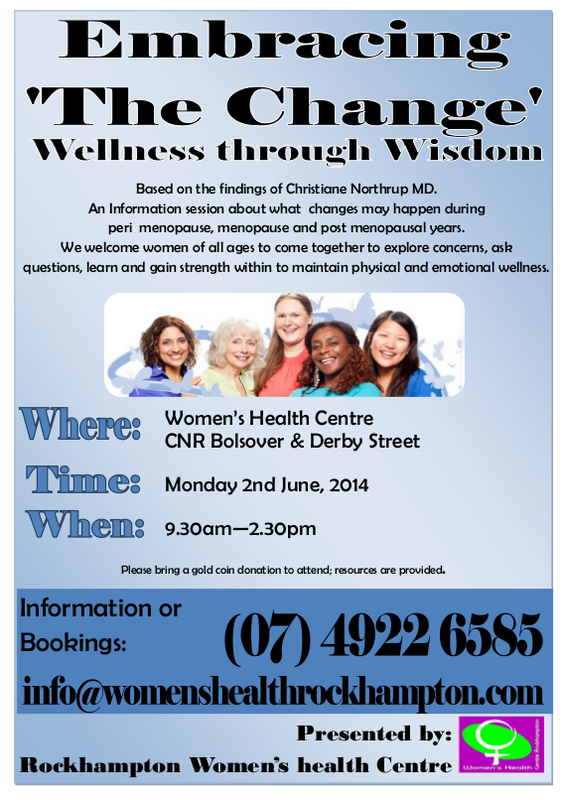 The Women’s Health Centre, Rockhampton will be holding a session entitled ‘Embracing “the Change” – Wellness through Wisdom’ on Monday the 2nd of June from 9.30am to 2.30pm. This session will focus on pre-menopause, menopause, and post menopause, and aims to be interactive and informative for women of all ages and backgrounds. Light refreshments will be provided as will resources, and all we ask is a gold coin donation for attendance. If you have any questions, or would like to RSVP, please contact the centre on (07) 4922 6585.